He’s eighteen years of age and the 6ft 3ins defender has already been capped by the Republic of Ireland at Under-19 level on nine occasions and was in the squad that just failed to make the European Championships three months ago. He’s known to both manager Steve Cotterill and his assistant Dave Kevan from their time at Stoke and Steve told the Burnley Express, “He is a central defender, a young kid, and has been, up until now, earning young boy's wages, and we have decided to bring him in here. "He is more or less on trial, and we will see how he goes. Up to now he has done very well. 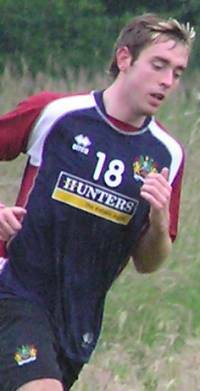 Keogh was a regular in Stoke’s reserve team in the centre of defence and he also had a spell with Vikingur in <?xml:namespace prefix = st1 ns = "urn:schemas-microsoft-com:office:smarttags" />Iceland during his time with the Potteries based Icelandic club.